DCT Gdansk and Maersk Line are proud to announce the arrival of the first Triple-E class vessel – Mærsk Mc-Kinney Møller – to DCT Gdansk container terminal on her maiden voyage from Asia to Europe. The arrival of the world’s largest container ship in Gdansk is a memorable moment for the city and the region, as well as an unquestioned milestone for the entire Polish container business. Mærsk Mc-Kinney Møller can carry 18 000 TEU (20-foot containers) and is the largest container ship ever built. Her integration into the Asia-Europe trade lane is a signal of the importance of this trade and the commitment of the carrier, Maersk Line, to deploy the new vessels to the route where it makes the most commercial sense. Within this corridor, Poland has become an important link in the chain moving goods to consumers in this part of Europe and DCT Gdansk has achieved the role of a regional hub, handling cargo not only for the Polish market, but also for the Baltics and other Central and Eastern Europe destinations. In 2011, when Maersk Line’s first E class type vessel Emma Maersk called DCT Gdansk, the carrier and the terminal set a new standard for servicing the Polish market and introducing innovative transportation solutions for the benefit of customers in export and import. In a changing market, innovation is of crucial importance in order to continue providing the highest level of service to our customers, says Thomas Bagge, Managing Director of Maersk Line in East Central Europe and head of Maersk Polska. The introduction of the world’s most efficient vessels is part of our drive to optimize our fleet. This is matched by our continuous efforts to optimize the entire network, in order to offer stable, reliable and consistent service to customers, he adds. Hosting Mærsk Mc-Kinney Møller during her maiden voyage proves that DCT Gdansk is ready to service ultra-large container vessels in the Baltic Sea region. Location and depth of water in the Port of Gdansk allowed DCT to assume position of a gateway to Poland and to the entire Baltic Sea region. Now, with Triple E vessels entering the Baltic, we are able to offer even more effective services. By being one of only 14 world’s ports that received the Triple-E, DCT Gdansk confirmed its role as the major Baltic hub port. We are honoured to be, together with our partner Maersk Line, the main driving force behind the development and constant innovation of the container business in Poland and the region, said Maciek Kwiatkowski, President of the Board, DCT Gdansk. 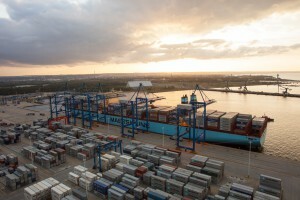 Maersk Mc-Kinney Moeller will discharge and load containers in Gdansk until Staurday, August 24th.